If you have any questions you would like to ask Jan or just want to make an appointment, contact us today. It’s not only what we do that makes styling your windows such a great experience, it’s the way we do it. Our proven process says it all; we say what we mean and we do what we say! Why do we talk about window “treatments” as if they had some kind of disease? Chances are, they just need a little style, and you should be showing them off instead. Start here to discover your style. We have been featured on Houzz. Check it out and let us know what you think! 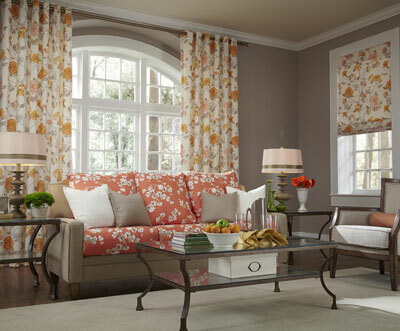 Custom draperies and window treatments are a great way to give any room in your home a fresh and special look. A little style can pay off handsomely in how your home feels to you and your guests. Jan Guigue is an experienced professional interior decorator that can help you with window shading, draperies, fabrics, vertical or horizontal blinds, wooden or bamboo, luminette, silhouette, mini blinds, lining, trim, fringe, solar blinds, shutters or faux and aluminum blinds. There also are panel tracks and vertiglides to consider. Many treatments are insulating and a thermo lining can be used. What about a new shower curtain, bedspread and pillows? It’s the wonderful small touches that say a lot and add so much in how you feel in your own home. Your only stopping point is imagination. Adding in different pleating styles such as a Euro pleat, goblet pleat, French pleat and of course the ever popular grommet topping add so much. Hardware is endless. There are wood poles, metal rods, clear and painted rodding. A beautiful finial can really add that special touch. Styles such as sheers, valances, box pleat valances, cornices, flat or hobbled roman shades in various materials from fabrics, wood, linen, silk, grass and bamboo, custom draperies and panels can add color and excitement. Add a band of color and the world of decorating can be yours instantly. From Traditional, Modern, Contemporary, Country, Urban, Oriental to Eclectic these many looks can be yours for the asking. Pricing starts very reasonable and budgets are always taken into consideration. When the installation is free it make it even easier. Special safety features and options such as cordless, clutch and remote closing are always available. We serve all of southwestern Michigan including Kalamazoo, Portage, South Haven, Paw Paw, Lawton, Mattawan, Three Rivers, Vicksburg, Schoolcraft, Allegan, Plainwell, Gobles and Saugatuck. Contact us today and we will help you create your very own style. We all have windows, and you either love them or you don’t, but we think everyone should love their windows. While it’s a crying shame if you don’t, it’s also an opportunity to update them to reflect your current style. If you don’t really know what your window style is, we might have a solution for you. Here are some examples to get your creative juices flowing, or you might even find your own perfect style! Blinds can be sleek and elegant, warm and cozy, rich and sophisticated, and blinds can even provide privacy when you want it. 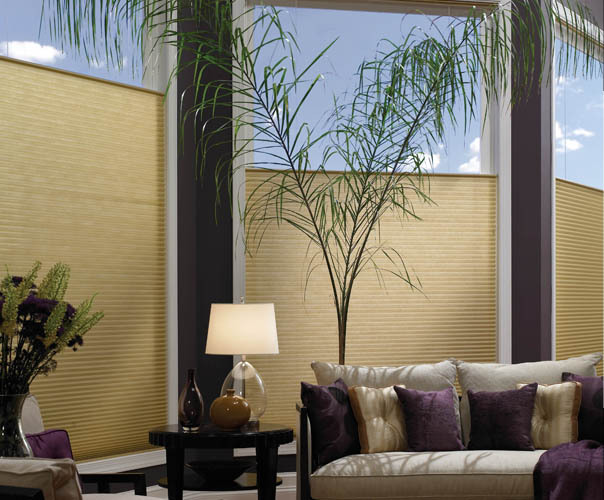 Either style of blinds, horizontal or vertical, can be the perfect touch in some rooms. Wood blinds are warm and inviting, and can be stained or painted to provide the perfect accent. Aluminum mini-blinds come in options that provide even better light blockage and insulation. Fabric covered vertical blinds are highly decorative and come in a large assortment of colors and patterns, plus PVC backing, a popular option, provides even greater light blocking and insulation. But hey, let’s not lose sight of the fact they are a great way to express your style! These window shades offer light filtering to total darkness and countless options, including motorizing them so that they can be also be controlled from your computer or smart phone as a feature in your SMART home. Lots of versatility here! Considered the “black dress” of window fashion these shades or blinds also come in a wide variety of colors and can be designed to open both bottom to top and top to bottom, giving you total control of both lighting and privacy in the way you style your window. 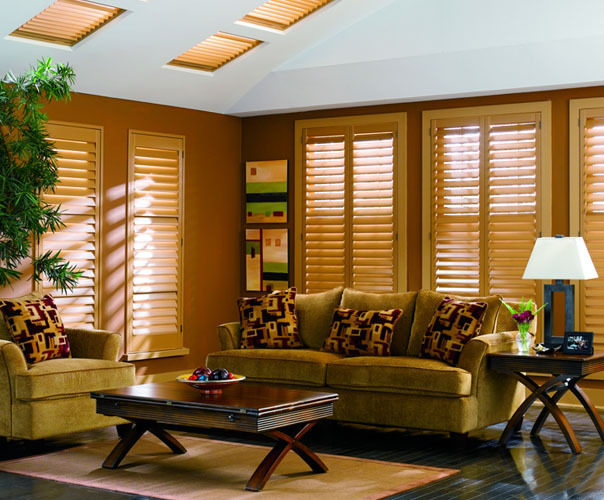 “Plantation Shutters” are commonly referred to as the ultimate window covering! Their versatility and remarkable good looks appeal to almost everyone, and make them desirable for both traditional and contemporary decors. Shutters are also popular for their ability to block or regulate light, and to some degree for their insulating qualities. May people feel that shutters contribute to higher resale values of a home, but everyone agrees that shutters are always one of those things that really say something about your style. Draperies offer another great option for covering windows, as do many other window styles, but none other can do it with the same fashion and flair. Draperies have come a long way since the Victorian era, but in certain essential ways their benefits are timeless. They can regulate incoming light, provide privacy and insulation, and best of all they can co-ordinate with other furnishings in the room to create a total sense of style. With draperies you are limited only by your imagination and sense of style! Sheers, Valances, and Roman shades can be employed as stand-alone styles or as compliments your window’s primary style, and we like anything that can help us to express your unique style in your windows! Roman shades can come from manmade or natural materials, including fabrics, wood, grass or bamboo! Valances can dress up a window in as many ways as you can imagine, and when it comes to Sheers, sometimes nothing else will do! A bright band of color or add some beaded trim, It all depends on your own unique sense of style! Contact us today with any questions you might have about our process. If you’re not satisfied, we aren’t either! The entire focus of our business is your satisfaction, and it’s something we take very seriously. Granted, the potential for a problem exists in every business, so our strategy is to prove how quickly we can remedy the problem to your satisfaction. While such circumstance are rare, we see them as an opportunity to show you just how much your business really means to us. That means contacting you the same day if possible, providing you with a temporary solution if feasible, and for sure giving you a time frame in which you can expect the situation to be remedied. In other words, your satisfaction is our top priority. What makes us different from our competition is not only the final result! I am often engaged with other clients or on site somewhere, so if by chance you fail to reach me immediately, rest assured that I will contact you within 24 hours or less. I look forward to the opportunity to meet with you to discuss your project, and I prefer to see your windows in the daytime when the light is good and natural. Trust me, it’s not because I don’t like to work evenings! Daylight is just the best time to see your rooms and windows. I find that showing up on time, and with everything I need, to be a great way to start! Not only am I interested in having you show me around, I want you to tell me about your needs, wants, budget, and lifestyle. Then I ask you a lot of questions (like do you have a big dog that comes into the house? Maybe we stay away from white silks!) until I feel like I really understand what is important to you about your lifestyle. Here’s where we look at samples, talk about the pros and cons of different products, explain warranties, co-ordinate colors, work through problem applications together, and I make whatever suggestions I think might be helpful to you. This is the part where you find just what you have been looking for! When I am satisfied that we have explored every detail that I believe to be important for your satisfaction, I measure your windows and give you a firm price that includes installation. When you are ready and all of your questions have been answered, I write up the order, receive a deposit, and schedule the installation. …OTHERWISE KNOWN AS THE INSTALLATION. When the big day arrives, so does one of my dedicated installers. Since they all have at least 30 years of experience, we can both expect this part to go very well! While they are finishing up, they will give you a brief questionnaire to fill out that serves two important functions: it provides us with your feedback so that we can be sure the entire process has met with your satisfaction, and it helps us to continuously improve. Blinds, Shades, and Draperies! Oh My! Contact us today and let us help you in the process of turning a house into your home. Jan consistently comes up with creative and innovative solutions. I worked with Jan on several projects throughout my home on different occasions and have always been pleased with the results. Jan consistently comes up with creative, innovative ideas to give my rooms both pleasing and unique looks while keeping us within our budget. I like her "out of the box" approach and especially her infectious enthusiasm for bringing new life to tired rooms. Jan Guigue is a delight to work with. We built two lofts in downtown Kalamazoo, each with a completely different style. Jan instinctively honed in on the feel and mood of each space. In our first loft, we used the top-down/bottom-up shades, with a black-out feature in the bedroom. At one point, we had a manufacturer's defect issue and Jan solved the problem with no muss or fuss to us personally. In our current space, we preferred Roman shades to match our Mediterranean ambiance. When we asked for a particular design detail on the shades, Jan’s experience and creativity came up with the answer. Jan's attention to detail is impeccable and her instincts regarding design are exceptional. Thanks, Jan, for your professionalism and vision. I have built several homes and spent a small fortune on windows in order to let in the light and provide a view of Mother Nature, so why would I want to cover them up? That’s where Jan comes in. She doesn’t see windows as some architectural feature that needs to be covered up, but rather an opportunity to help me express my own decorating style. Jan has a terrific sense of style and color, and she always has great ideas for making a window really fit the home. Plus, she has the unique ability to “read” her clients’ own personal style and the artistic flair to make bring my style to life. I would use no one but Jan for my windows. I can't wait to use Jan again! In the middle of redecorating my bedroom I had an unfortunate accident that confined me to bed for 8 weeks. I was at the paint and drapery phase so I called Jan. She came to my house several times with paint samples, fabrics and the latest decorating articles, effectively doing all of my legwork for me. I was able to get beautiful blinds and drapes in my bedroom and drapes blinds and a shower curtain in my bathroom. When I decided I wanted less light in my bedroom, Jan even reconfigured my valances to block out more light. She’s a miracle worker!  The personal design service is wonderful and her prices are very competitive. I plan to use her design services again for the next room I redecorate. Thanks Jan! Jan guided me to the products that fit my needs. Jan made completing the work that I needed both quick and easy. As I am out of town often, the fact that Jan was on time and efficient was very important to me. I also can't spend a lot of time shopping for things I don't know much about, and with my input she guided me to the products that fit my own personal needs. When it was time for the installation, the installers contacted me with a heads up on their arrival time and it went like clockwork. I received a fine look for my lifestyle, a top notch installation, and someone I know I can always call on for help and a reasonable price. That’s my way of doing business! Jan is a valued member of our team. We regularly include Jan Guigue in our commercial and residential projects as a valued member of our team. She is a passionate professional who can meet a budget and a schedule, and she consistently exceeds our expectations. We have worked with Jan for over 8 years. We’ve found Jan to be a tremendous “idea” person, well versed in her craft and up to date with her approach to styling windows. Unlike many contractors, she is on time and delivers per her commitments. Jan has also been willing to go the extra mile and render opinions and ideas for major decorating challenges, a real bonus when we were retrofitting our home. Jan is on our short list of resources.